Keeping a constant data connection is getting easier every day, whether we're in heavily populated areas or in the middle of nowhere. But there are still situations when we're bound to lose service, perhaps during a power outage or while driving through a dead zone. Just because you've lost access to Google's servers, it doesn't mean you should lose all of the powerful capabilities your phone has to offer. 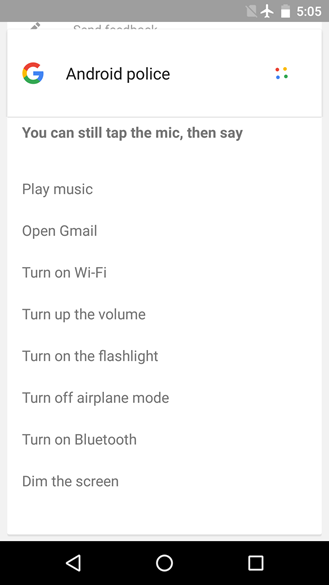 Google has just enabled a small set of voice commands for use even when you're completely offline. 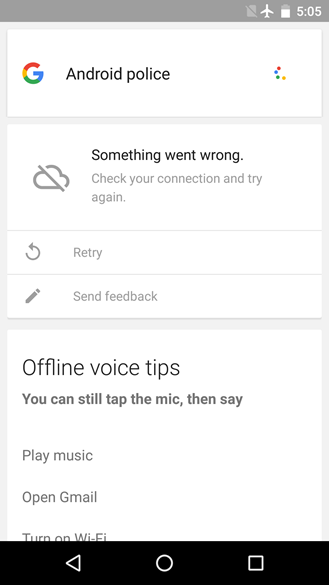 If your phone was offline about a week ago and you tried a voice action, you probably would have seen a "Something went wrong" error message pop up just below the Google search box. 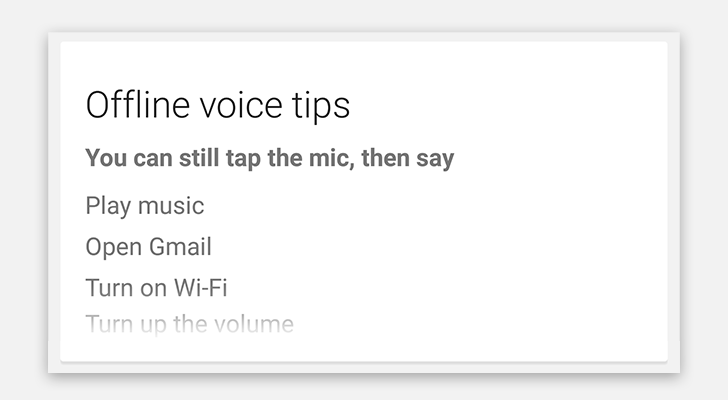 Now, the warning will still show up, but just below it is a new card titled "Offline voice tips" with a short list of voice commands that should work sans data connection. Try one of the suggested phrases and Google's on-device interpreter figures out what you said and performs the action, usually with a quick audible response from the text-to-speech engine. If the instruction involves turning on or off a single setting like Wi-Fi or Bluetooth, a card also pops up with the toggle. The "Open" command can be used to launch any app that's installed on your device, not just Gmail. "Play Music" is a bit unique in that it doesn't just launch directly into your music player of choice, but actually starts playing a randomly chosen track. If you are offline, it will pick locally stored music. Commands that begin with "turn on" will obviously also work with "turn off." They also allow for simple variations like "shut off flashlight" and "disable flashlight" instead of "turn off flashlight." There are still a couple of odd bugs, though. Telling Google to "enable flashlight" is recognized and even produces an audible confirmation, but the Flashlight card never appears and the LED doesn't flip on. Most of these phrases do what they're supposed to without any extra work, but some of them (i.e. volume, screen brightness, and airplane mode) drop users into the relevant Settings screen where they have to make manual adjustments. For volume and screen brightness, this makes sense because it's hard to quantify the expected result. Unfortunately, that means we have no way to modify those values without looking at and touching the screen. Coincidentally, those are the two things we're most likely to want to control hands-free while we're occupied with driving or messy from cooking. As for airplane mode, I've got no idea why it's not treated as a toggle. This may be another bug. 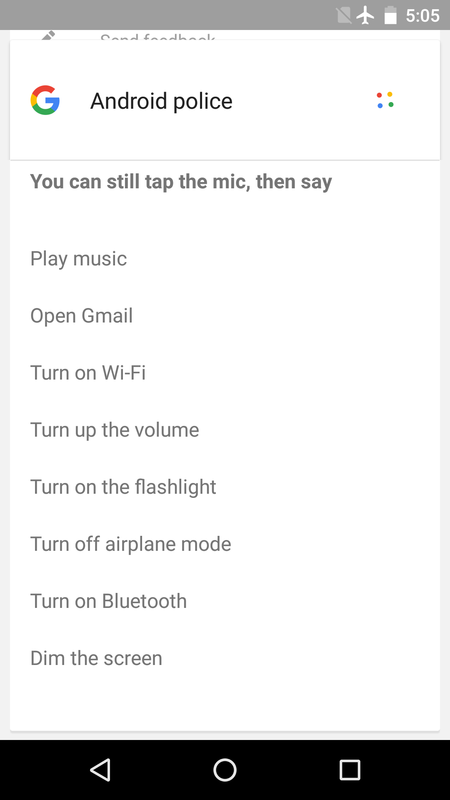 It should be noted that some of the old voice commands like "call" and "send text to" still work as they always have. The first signs of offline voice support appeared in a teardown of the Google app back in June, but the capability was not enabled at the time. It's not clear exactly when this feature was activated, but it was still not available when I tested for it early last week while writing a teardown of Google v5.3. So far, it seems like offline voice support might be limited to just the US or devices with English as the primary language, but it's not entirely clear what the restrictions are. It does require the v5.3 of the Google app (available at APK Mirror or the Play Store) and the offline language pack. The list of actions certainly isn't very long, but there are only so many things that can be done without a functioning data connection. We can probably expect to see additional commands in the future for things like Do Not Disturb modes, ending Google Cast sessions, and possibly even launching more actions within apps like the "Play Music" command does. In the meantime, the initial set of commands are definitely a good start and should help us stay hands-off a little more often. [Weekend Poll] Nexus 5X Or 6P?